Poppy and Erasmus are certain there's something peculiar going on in Suds, and they're determined to unravel its secrets. But when they discover the answers might lie in the darking and twisting woods, can they find the courage to creep inside and solve this riddling mystery? Born in Tasmania with Irish roots, Samuel J. Halpin is 27 and writes daily. Having studied journalism at the University of New South Wales, Samuel went on to take cinematography at AFTRS, the national Australian film school in Sydney before moving to London and working in comedy TV production. The Peculiar Peggs of Riddling Woods is his first answer to a childhood raised on a hodgepodge of fairy tales, crowded bookshelves and cups of hot chocolate. Poppy put the kettle on the stove. The kettle whistled as it began to boil and Poppy poured the hot water over the fragrant tea leaves. Poppy put the kettle down and brought Grandma her tea. Churchill the pig rested his snout on the edge of his basket, as if listening to the story too. Poppy nodded politely. She didn’t quite know if she believed her wily old gran. She was twelve after all, and twelve is the age when one truly starts reasoning what is real and what is fabricated. Poppy retrieved the sugar, heeding Grandma’s instructions. “That’s not real,” muttered Poppy, her chest swimming with unease. Poppy fetched her notepad from her backpack and wrote down what Grandma said. With each line she wrote, her fingers stiffened and her heart began to dance its familiar dance. 1. All washing must be done during the day. Bring your clothes in off the washing line (even if they are wet) before six o’clock every night. 2. All sugar cubes are to be kept under lock and key. 3. At night close your window, lock it, draw the curtains. 4. NEVER, DON’T YOU EVER, dust the window sills. It is beautifully written and has characters you can enjoy getting to know. The story keeps you interested right through to the end. Prepare for a quirky read that will keep you on the edge of your seat. The real joy of his writing lies in his ability to observe adult vanities through the eyes of a child. 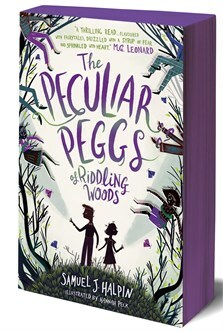 With its fast-paced action, tantalising air of mystery, finely wrought balance between good and evil, and the stunning illustrations of Hannah Peck to add extra life and vibrancy, The Peculiar Peggs of Riddling Woods is the best-stitched piece of adventure storytelling you will read this year. An enjoyable balance of chills, mystery and humour all wrapped up inside a plot that will keep the youngest readers hooked until the very last page. a charmingly dark tale that's dripping with style. Drawing inspiration from fables and legends, it creates an adventure that will send a chill up even the bravest reader's spine. Darker in tone than much of the current crop of middle-grade adventures, Halpin weaves a tantalising web with echoes of Tim Burton and Neil Gaiman. A story woven in the finest of silk threads and stitched full of imagination. Poppy and Erasmus will warm even the coldest of beating hearts! It’s amazing - I’ve read it over and over and found it amazing. I can’t wait for the next one to come out. One of the most intriguing and brilliant adventures I have read in a while. I absolutely loved the world that was created in Suds. I found that whilst there was mystery and [SPOILER ALERT] magic, this universe created by Sam was utterly real. The grief Poppy felt whilst with her gran, the difficult relationship between Erasmus and his mother, Misty grabbing onto the one person who really sees her. It was wonderful and beautiful and I want to go to Suds and meet Poppy, Erasmus and Misty and tell them they are brave little souls! And I want to pet Marley the dog so much! Such a smart doggo! Great book! Great fun! Wonderful read. 5/5 stars and definitely recommended for any boy, girl or other. I enjoyed the peculiar story of Peggs of Riddling Woods and will be recommending it to everyone. I really enjoyed this book as I found myself trying to piece the puzzles of Gran’s rules and the odd happenings in the town of Suds. This story is quite dark and cryptic in places. The main characters - Erasmus and Poppy support each other through the difficult times along the way. Loved every chapter of this book. The writing style is so immersive and the magic woven throughout the adventure that main character Poppy goes on left me speechless! This book is quite scary in places, but also an exciting read. My favourite character was Erasmus because he was clever and had a good memory. Fans of Harry Potter would love this book! Teacher's notes with discussion topics and classroom activities structured around the UK National Curriculum for The Peculiar Peggs of Riddling Woods (pdf).